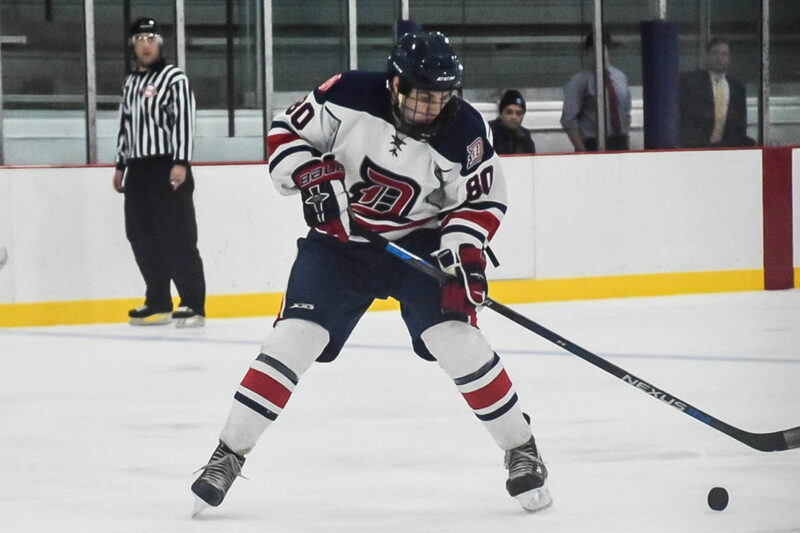 The Duquesne Dukes defeated the Mercyhurst Lakers on Thursday night, 9-4, to take the conference lead with a record of 9-3. Mercyhurst dropped their eighth game in a row and their fourth conference game in a row. The Lakers sit tied with John Carroll but are on the outside of the playoff race, looking in. Duquesne started Thursday’s game fast, getting a goal from sophomore forward Manny Mancha just 21 seconds in. Sean Lloyd notched his 30th point of the season with a goal at the 3:45 mark of the first and rookie forward Johnny Percoskie scored about a minute later to give the Dukes a 3-0 lead. Sophomore forward PJ Breslow added one of his own with 6:11 remaining to put the Dukes up 4-0 after one period. That’s when things got wild. Mercyhurst made a goaltender switch, opting for Justin Nevinger to play damage control for Billy Wager, who had allowed four goals on 15 shots. The Lakers then went on a four-goal stampede of their own. Two goals by Ryan Rebmann 23 seconds apart and a goal by Nate Shemo, all within the first four minutes of the game, moved Mercyhurst to within a goal. Adam Nishino tied the game 4-4 at the 7:00 mark of the second, which resulted in a substitution between the pipes for the Dukes. Wade Conlan relieved Alex Taylor of his command after the latter allowed four goals on 21 shots. Conlan made all three saves he attempted in the final 13 minutes of the second period. Breslow then added his second goal of the game with 39 seconds remaining to give Duquesne a 5-4 lead heading into the locker room after the second period. If the second period was almost all Mercyhurst, the third period was completely all Duquesne. Sophomore defenseman Greg Scolieri added his second goal of the season at the 3:29 mark of the third on assists by Percoskie and Bigley. That goal gave each of those three players a two-point night. Then the first penalties of the game were handed out. Duquesne freshman forward Clinton O’shell was called for kneeing. Fortunately for the Dukes, Tyler Decosse for the Lakers was called for a coincidental roughing penalty and a 10-minute misconduct. Manny Mancha quickly took advantage of the power play opportunity and added his second of the game on assists by Hubert and Lloyd. Not to be outdone, Lloyd added his own power play goal from assists by Hubert and Breslow. Frank Rotello added the final tally for the Dukes with less than a minute to go to give them the 9-4 victory. Sean Lloyd finished with two goals and two assists, Martin Hubert finished with three assists, and Manny Mancha and PJ Breslow each finished the game with two goals and an assist. Lloyd has 33 points on the season (18 goals, 15 assists). Hubert has 25 points (8 and 17), and Breslow and Mancha each have 23 points (13 goals for Breslow and 14 for Mancha). Wade Conlan saved all 13 shots he faced in the final 33 minutes in the relief effort. Duquesne heads into a road trip to face William Patterson and Drexel on Saturday and Sunday, respectively. Mercyhurst heads out east to play at Drexel and West Chester on Saturday and Sunday, respectively.